Since the ’90s, few characters have held the public’s imagination the way that Spawn has. Consistently a best-seller, Spawn inspired an Emmy Award-winning animated show long before the days where comics ruled the television programming, and a live action feature film as well – with upcoming reboots planned for both. Plus countless video games and action figures. 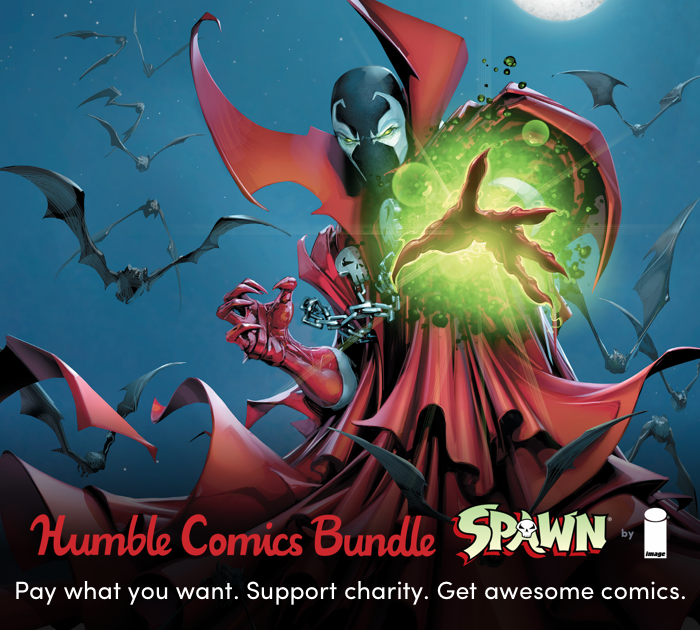 Well, now you can dive into what makes this antihero so compelling, with this massive Humble Comics Bundle, featuring Spawn, lots of Spawn. Pay what you want for more than 20 DRM-free digital volumes of Spawn Origins, featuring the work of Todd McFarlane and Greg Capullo, but also guest creators, Alan Moore, Neil Gaiman, Grant Morrison, Mark Silvestri, Dave Sim, Steve Niles, Robert Kirkman and more! On top of all that, every purchase supports the critical work that Comic Book Legal Defense Fund and Traveling Stories do each day. Starting at $1, you can support important nonprofits and get amazing comics! Don’t wait, this bundle only runs until Wednesday, February 20th, 11:00am Pacific. Traveling Stories aims to empower kids to outsmart poverty by providing literacy and money management skills they need to become productive members of society. Founded in 2010, Traveling Stories wanted to provide a program for at-risk kids that would not only help them learn to read, but also help them fall in love with reading. In 2011, Traveling Stories created the StoryTent: a mobile literacy program that would provide one-on-one reading support and motivational incentives to kids. For every book read, kids earn a Book Buck, which can be redeemed for prizes. This keeps the kids excited and motivated to learn, as well as teaches them money management skills. Traveling Stories currently serves over 3,000 local kids a year between the ages of 2 and 12, with weekly programs in El Cajon, City Heights, Imperial Beach, Vista, and La Mesa. Don’t forget in February, CBLDF supporters can contribute to the fight for free speech by purchasing any Humble Bundle offered! Or check out our Reward Zone for beautiful, signed copies of your favorite comics!